"and of cardinal Wolsey's words: If I had served my God as I have served my king He would not have abandoned me in my old days. He walked by the treeshade of sunny winking leaves: and towards him came the wife of Mr David Sheehy M. P.
From the CE 1912: Cardinal Wolsey (1471 - 1530) was educated at Oxford, took his degree at 15, and was ordained at 17. He started as a chaplain to the Archbishop of Canterbury. Noticed for a remarkable talent for administration, he entered the diplomatic service of Henry VII, then Henry VIII. By 1512 he was exercising marked influence in political affairs. 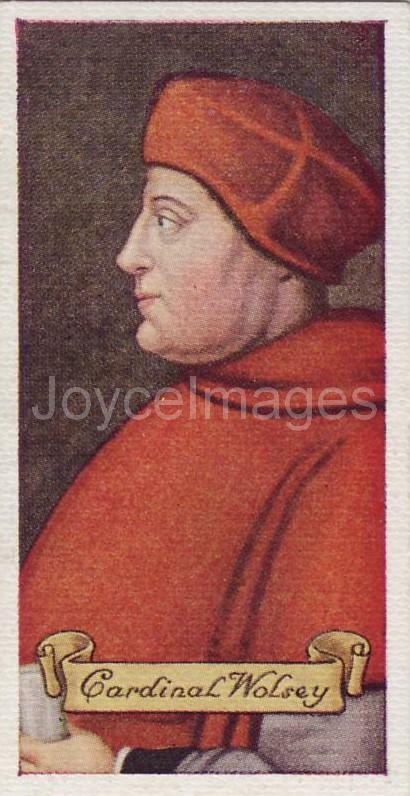 His career rapidly avanced, as he became Bishop of Tournay, Bishop of Lincon, Archbishop of York, cardinal, Lord Chancellor of England (1515), and was considered for papacy. He had thus attainted at the early age of 43 the highest dignities, spiritual and temporal, that a subject could hope for. However Wolsey gradually fell in disfavour, owing to his foreign policy and rivalry with Anne Boleyn, and was stripped of many of his titles. He was in residence at Cawood near York, embittered and in poor health, when commissioners from the king came to arrest him (1529) on a charge of high treason. Slowly and as an invalid he travelled towards London, knowing well what to expect. "Master Kingston, I see the matter against me now it is framed; but if I had served God as diligently as I have done the king He would not have given me over in my gray hairs." The end came at Leicester Abbey where on arrival he told the abbot, "I am come to leave my bones among you." He died unregretted by any save his immediate attendants.